My friend and former boss Rowland Archer has a hobby of astrophotography. He’s built up quite a collection of stunning photographs that he’s taken from the little observatory he’s build in his backyard outside of Durham. 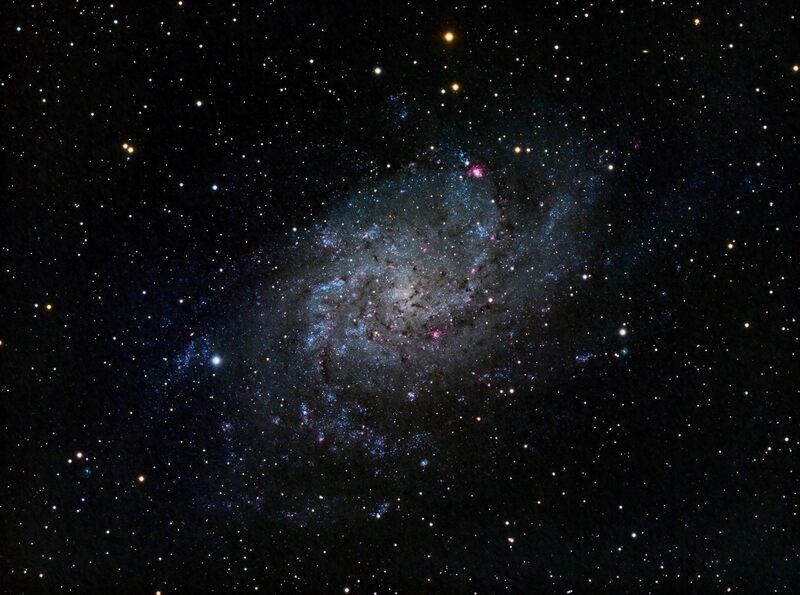 Here’s one of the latest photos he’s shared, of the Milky Way’s nearest neighboring galaxy, Messier 33. This is Messier 33, the Triangulum Galaxy, so named because it is in the constellation Triangulum and was the 33th object discovered by Charles Messier – who was a comet hunter and famously compiled a list of “darn, another fuzzy thing that’s not a comet!” Ironically, his list of stuff to avoid is now one of the most popular list of things to observe! M33 is part of the local group of galaxies – it’s smaller than our Milky Way, and fainter than the Andromeda Galaxy posted earlier this week, but I think it’s a rocking looking galaxy from our view here on Earth – the blue spiral arms, the red knots of color in the arms that are active star forming regions, and the individual stars visible in both. It’s about 3 million light years away from us, and contains “only” about 30 billion stars. But it’s still the third largest member of our local group – our neighborhood of galaxies that are close enough to be bound together by gravity.